Social media are a central part of the experience of using the internet, and indeed much current research tends to be about social media rather than ‘the internet’ as such. Recently there was a discussion on the AoIR email list regarding definitions of social media, and I’m just summarising what was said there for my own benefit, my students, and anyone else who is interested. I tend to leave out the reference to ‘Web 2.0’ when I share this one with students, although it is historically accurate, because it requires extra explanation that is not usually important in the context of the class. Nonetheless, it is an important reminder of how social media have mostly developed as commercial endeavours designed to extract value from various forms of immaterial labour (digital, affective, emotional, etc.). I like the Kaplan and Haenlein paper also because of the way they map out different dimensions of ‘Self presentation/disclosure’ and ‘Social presence/Media richness.’ This helps to think about the different interactive environments online. In ‘Social Media: Defining, Developing, and Divining,’ Carr and Hayes (2015) provide an excellent discussion and breakdown of social media. Internet-based, disentrained, and persistent channels of masspersonal communication facilitating perceptions of interactions among users, deriving value primarily from user-generated content. Social media are Internet-based channels that allow users to opportunistically interact and selectively self-present, either in real-time or asynchronously, with both broad and narrow audiences who derive value from user-generated content and the perception of interaction with others. They explain the components of these definitions in detail (e.g. ‘disentrained’ means communication where the two parties can choose to participate at will, and do not need to be committed at the same time as would happen in face-to-face communication). Interestingly, there is a difference that arises with Kaplan and Haenlein’s model. Carr and Hayes also lay out some examples in a table, and for example, Wikipedia does not make it into their definition of social media, and nor does Tumblr. Neither of the above definitions are included in a “non-exhaustive” overview of definitions of social media in Fuchs (2017: 37–39; prepublication chapter available here. Social media are web-based services that allow individuals, communities, and organizations to collaborate, connect, interact, and build community by enabling them to create, co-create, modifies, share, and engage with user-generated content that is easily accessible. Kietzmann et al. 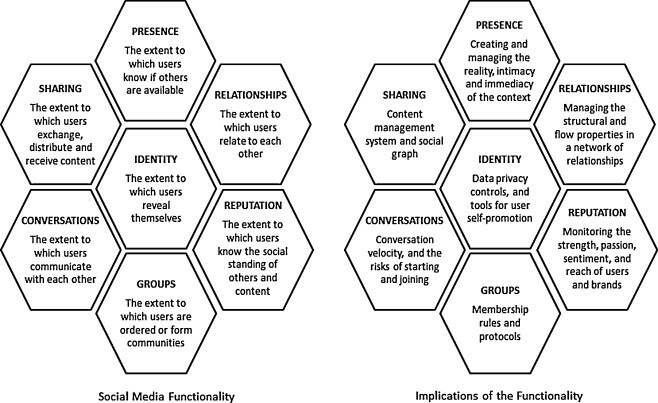 (2011: 243) also offer a typology that emphasises the different functionality of social media. They put identity at the centre, which is an important reminder of how social media are become increasingly important for users’ conception of their self and of others. By social media technologies, we mean those digital platforms, services and apps built around the convergence of content sharing, public communication, and interpersonal connection. This comes from an approach that emphasises sociality as text and is based on the premise that all interactions are mediated, and therefore focusing on the medium (that mediates interaction) takes second place to the content (symbolic, practical) of that interaction. Social media are computer-mediated communication software that enable users to create, share and view content in publicly networked one-to-one, one-to-many, and/or many-to-many communications. Also, I have usually found myself referring to ‘social and mobile media’ as a catchall so as to be able to include ‘over-the-top’ instant messaging apps (such as WhatsApp) that are widely used (though not everywhere, for example in the USA about 29% use these, compared to 92.7% in Malaysia). BURGESS, J. & T. POELL (eds) 2017. The Sage Handbook of Social Media. London: Sage Publications Limited. CARR, C. T. & R. A. HAYES 2015. Social Media: Defining, Developing, and Divining. Atlantic Journal of Communication 23, 46–65. ELLISON, N. B. & DANAH BOYD 2013. Sociality through Social Network Sites. In The Oxford Handbook of Internet Studies (ed) W. H. Dutton, 151–172. Oxford: Oxford University Press. FUCHS, C. 2017. Social Media: A Critical Introduction. London: SAGE. HORST, H. A., D. Miller & H. Horst 2012. Digital Anthropology. London: Bloomsbury Academic. KAPLAN, A. M. & M. HAENLEIN 2010. Users of the world, unite! The challenges and opportunities of Social Media. Business Horizons 53, 59–68. KIETZMANN, J. H., K. HERMKENS, I. P. MCCARTHY & B. S. SILVESTRE 2011. Social media? Get serious! Understanding the functional building blocks of social media. Business Horizons 54, 241–251. MARGETTS, H., P. JOHN, S. HALE & T. YASSERI 2015. Political Turbulence: How Social Media Shape Collective Action. Princeton and Oxford: Princeton University Press. MCCAY-PEET, L. & A. QUAN-HAASE 2017. What is Social Media and What Questions Can Social Media Research Help Us Answer? In The SAGE Handbook of Social Media Research Methods (eds) L. Sloan & A. Quan-Haase. ProQuest Ebook Central. MCMC 2016. Internet Users Survey 2016. Malaysian Communications and Multimedia Commission (available on-line: https://www.mcmc.gov.my/skmmgovmy/media/General/pdf/IUS2016.pdf, accessed 15 July 2017). MILLER, D., E. COSTA, N. HAYNES, ET AL. 2016. How the World Changed Social Media. London: UCL Press (available on-line: https://www.ucl.ac.uk/ucl-press/browse-books/how-world-changed-social-media, accessed 15 April 2016). PEW RESEARCH CENTER 2017. Internet/Broadband Fact Sheet. Pew Research Center (available on-line: http://www.pewinternet.org/fact-sheet/internet-broadband/, accessed 20 July 2017). You’re welcome, it’s mostly just collating what was said in the email discussion.